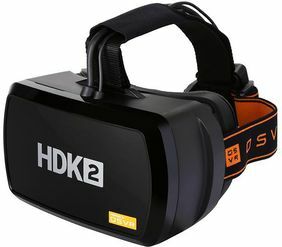 For a list of games, see List of VR games. 1080 x 1200 per eye. Total resolution of 2160 x 1200. 90 Hz Low Persistence OLED, 100° FOV. Uses IR camera for positional tracking. Seated and standing supported. 3.5mm combo jack and microphone. Breakout box, Fixed IPD, Proximity sensor and Independent eye relief adjustment. 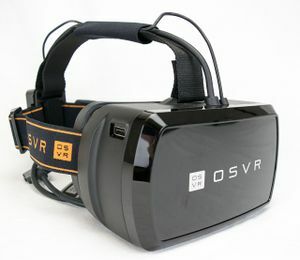 OSVR Hacker Development Kit 1.4 aka OSVR HDK was the first release by OSVR, intended as developer hardware. 960 × 1080 per eye. Total resolution of 1920 x 1080. 60Hz Low Persistence OLED. 100° FOV. Breakout box, 2.5m cable, Fixed IPD, Proximity sensor and Independent eye relief adjustment. This page was last edited on 17 April 2019, at 20:15.